What ways can I manage my content? How do they differ? 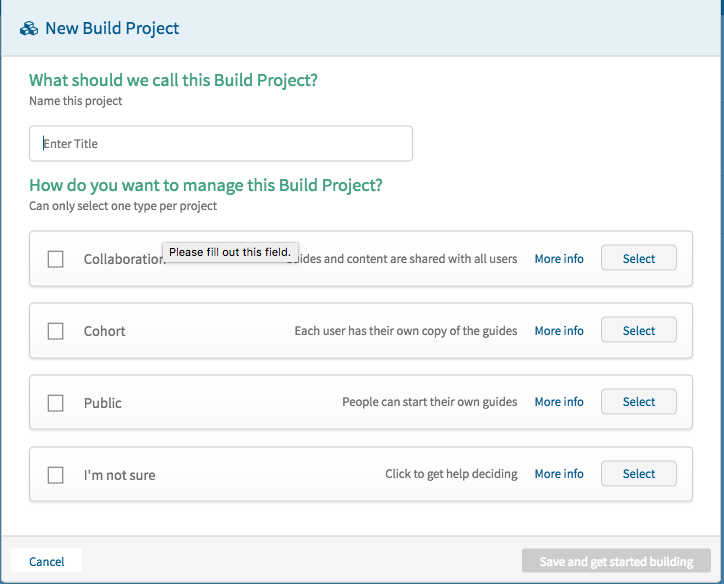 When you want to create a new build project, start by clicking on the green ‘New Build’ button on the right hand side of the Build & Share panel. You will then be prompted to enter a title and select how you want to manage the it. There are three options for sharing Building Projects, each can help you accomplish different task depending on the scenario. Collaborations: Users share a single copy of the content. This content can only be accessed by invitation (Private). Cohorts: Users have their own copy of the content. This content can only accessed by invitation (Private). Scroll down to see three example scenarios. In the most basic scenario, you educate the public on car safety. You have created a guide and want to share your content so that everyone can see it. The important part to note in this situation is anyone and everyone with a computer, mobile device, or tablet has access. This would be managed as a Public project. In the next scenario, you are a teacher who wants to use Navitome for a group project. This project will be a collaboration between all the students so you want to share the guide so that everyone has access to the same guide and content. Everyone can contribute to the guide in this case. This would be managed as a collaboration. In the last scenario, you are a CPR instructor with a new class of trainees. You create a guide containing all the course material and exercises and want each trainee to have their own copy. Content remains the same for each trainee but they have their own guide to work on at their own pace. This would be managed as a cohort. Can I see a list of users who fit a specific profile? How can I see what an individual has done in a specific guide? How do I see analytics on a specific date range? How do I see what all users are doing in a specific guide? Is all of the analytics data in the analytics dashboard? Is there a way to see if users are reading my embedded learning libraries? Where can I view the analytics? Can I quickly copy an entire guide? How do I create a object in the authoring panel? How do I customize content for specific users? What is the purpose of a question in a guide? How does the positioning on the authoring canvas correspond to what the end user will see? I accidentally delete an entire path. What can I do?!?! Is there a way to preview my guide without leaving the authoring canvas? What are the different types of content I can put in a guide? What is a Navidoc? And how do I create one? What’s the difference between a survey question and a question in the authoring canvas? Can a Build Project have more than one Builder? How do I add a Navidoc to my Build Project? How do I manage what specific content can be seen by readers? How do I manage who the Navidocs are shared with? What is Build & Share? Where can I find the link to share a guide? Can I communicate with other account holders on Navitome? What is a Direct Message? What is a Project Message? Besides the actual content of the guides, what else can I customize? Can I change how completion is marked? How do I force a user to go through my content in a specific order? What’s it mean to gate content and how do I do it? Where can I leave a comment for my internal colleagues like another author or reviewer? Can I import content from DITA sources? How do get my authored content out of Navitome? How do I import or export an entire guide? How do I import or export pieces of a guide? How do I let my users log in through Facebook? Where do I specify a Facebook App ID? Where do I specify a Facebook Pixel Code? Where do I specify a Google Tag Manger ID? Where do I specify an Intercom App ID? Can I customize the emails that go out to my customers? Can I specify who receives the support emails for my account? How do I invite internal (author, admins, review) users to my account? What does the availability toggle do? Where can I get the link for a public guide? What is the My Guides panel for? How do I make add a new Reviewer? How do I show that I'm done reviewing the Navidoc? What is the Review panel for? What is an account owner? What is the role of a Builder? What is the role of a Reader? What is the role of a Reviewer? What is the role of an Analyzer? How do I add one? What is the role of an Author? Where does support go for my account? How do I see the answers to my survey question? What is a survey question and how do I create one? What types of files can I ask people to share through survey questions? What ways can a user give feedback for guide content? Can I specify an image that’s used for social sharing of a guide? How do we white label our account space? What parts of the look and feel can we customize? How do I update my information including my password? How do I mark a page as completed? How do I save my progress? Is there any way to print a summary of what has to be done in the guide? What’s the red dot next to the title of my page? Why can’t I progress to the next page? Can I change the answer to a question that I answered in the beginning of the walkthrough? What’s happening when I answer questions in the beginning of the guide? When I answer a question in the beginning of the guide, who sees what answer? When I answer a question that’s in the content of a guide, who sees that answer? How do I get help in the software? How do I leave feedback for an author? Can I change the name of my guide? How do I come back to a guide on which I previously worked? How do I search for something in my guide? How do I share a guide with other people? How do I start a new guide? What should I name my guide? What’s the My Files section in the top right of the guide? Ready To Replicate The Success Of Your Top Sellers?